How Many Restrooms Will I Need For My Event? | Anderson Rentals, Inc. How Many Portable Restrooms Will I Need For My Event? – Anderson Rentals, Inc.
How Many Portable Restrooms Will I Need For My Event? What Size Shower Trailer Rental Is Right for Me? What Size Roll-off is Right for Me? 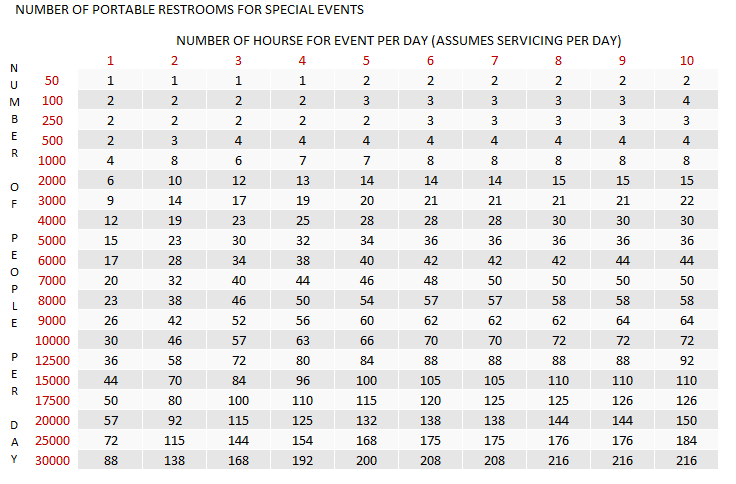 Our portable restroom usage chart gives a basic breakdown of determining the number of portable restrooms needed at a special event. Please keep in mind that certain factors may skew this chart. Below is a list of questions to consider when determining your final numbers. If alcohol is being served at your event, we recommend adding an additional 15-20% to the total number of portable restrooms needed for your event. State regulations require that portable restrooms and hand washing facilities be setup in areas around but not immediately adjacent to food service areas. The quantity for the portable restrooms and hand washing facilities may be based on state, county or local regulations. Food prep and service areas may have special requirements; hand washing facilities for these areas can not be simple hand sanitizers due to the food handling. Contact your local health department for additional information on these requirements. Are there any additional permanently built restrooms available on site? Any available on-site or permanently built restrooms on the event property should be considered based upon the number of people these facilities are designed to accommodate. How large is the event space? If event space is a problem for a large quantity of portables, then perhaps an alternative to reducing the number of portables is an increase in the service/cleaning of the portables during the day of the event. If the units are serviced twice during each day of the event, you can cut the number required in half. If the portable restrooms are serviced three times in a day, you can cut it to a third. You may have to pay a premium for the additional services but when the choice is more parking for paying patrons or more portable toilets the additional business could be worth the expense. It’s also important to note that our air conditioned restroom trailers can substitute for up to 30 portable restrooms. Consider a combination of the two. A few portables placed near the trailers allow for shorter lines, especially for those who may have an urgent need! A few portables placed strategically near parking areas are always appreciated as well. Our air conditioned restroom trailers also make a great all-in-one package for intimate gatherings, such as a wedding or outdoor party. Still have questions? We’re happy to help. Contact us today at 1-800-553-2213 and we can design a custom portable restroom plan that’s the right fit for your event’s needs. I was talking to a good friend of mine the other day about her interest in getting a portable toilet while planning an event. She wants to know how many she will need for this to be made easier. I think she would appreciate knowing that the size of the event space will largely dictate the answer to this question. I find it interesting that if alcohol is involved in the event you should add around 15% more portable toilets to your event. My sister is having an outdoor wedding in a few months and is wanting to get portable toilets for her guests. I’ll have to look into the best company that we can get these from. I like what you said about making sure there are enough portable restrooms at your event but not having them too close to the food and food prep areas. My friend is running a large outdoor event and wants to make sure everyone can relieve themselves and also not have to worry about food contamination. Thanks for the information about setting up things this way and also adding hand-washing stations. I really like the benefit of a temperature controlled portable toilet, especially in a portable toilet trailer! One of the big turn offs for a portable toilet for me has been how hot they can get in the summer, especially at our local fair each year! If I was in charge of planning our county fair, I would be sure to invest in temperature controlled portable toilets to make the patrons more comfortable! My sister is having a wedding party with a ton of people, and she put me in charge of renting the portable toilets. Your article had some great tips for knowing how many porta potties you’ll need for a certain amount of people, and I liked how you said to add about 20% more toilets if serving alcohol. Thanks for the help; I’ll keep this in mind when renting about 3 porta potties.